Since they began taking in foster children seven years ago, Cynthius Scanlon and Susan Schneider have cared for more than 60 kids awaiting adoption or return to their families. "Usually we have two babies, three to five kids in all," says Scanlon. "One of our goals is to keep siblings together. We try to make it 'one stop,' until they are adopted or taken back." The couple provides a "tier 3" home, capable of serving the most medically fragile children, some of them damaged by exposure to meth in utero. 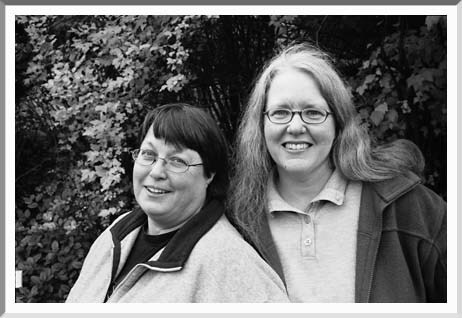 Scanlon and Schneider had a successful business making herbal aromatic products when when they moved from Boring, Oregon, to Eugene in 1994. "Our number-one seller was refillable organic catnip slugs," says Schneider. "We got fan mail from cats." They sold the business after they adopted Chris, an 11-year-old whom Scanlon had tutored in a foster home. They began their foster-care career as respite providers, offering weekend breaks to regular foster parents. "It's good work for the heart," says Scanlon. "The kids come in tough &emdash; they don't trust anyone. They drop that and learn to laugh and play when they don't have to worry about food and safety."